Though many dealers welcome the current “correction” with the silver market – they plan to buy at the lower numbers, we’re going to give the silver metal subject a rest. Instead, we’re going to look at a silver half dollar. This half dollar is only one of two silver half dollars minted since the demise of silver in our circulating coinage. Yes, we had the 40% Kennedy half dollars from 1965 through 1970 and the 40% bicentennial coins (quarter, half dollar and dollar) to celebrates the 200th anniversary of the American Revolution. Oh, but, if we consider the silver proof sets begun in 1992, then this half dollar would be the third 90% silver half dollar. 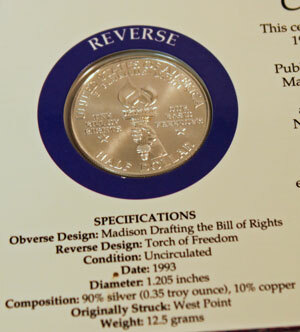 Regardless of its production sequence, the Bill of Rights half dollar was the second of only two modern commemorative half dollars with 90% silver. The first was the 1982 George Washington half dollar. Other modern commemorative half dollars are struck using the cupronickel alloy. In addition to its composition, also interesting are the mintage numbers for the uncirculated Bill of Rights half dollar. Of the just under 200,000 uncirculated coins the US Mint made at their West Point facility, they struck just under 10,000 specifically for a joint effort with the American Numismatic Association and the James Madison Memorial Fellowship Foundation. The package consists of a glossy, coated cardstock. On the left front, a picture of James Madison resides above the emblem for the American Numismatic Association. The title on the set identifies the uncirculated half dollar as part of a limited edition, serially numbered set. 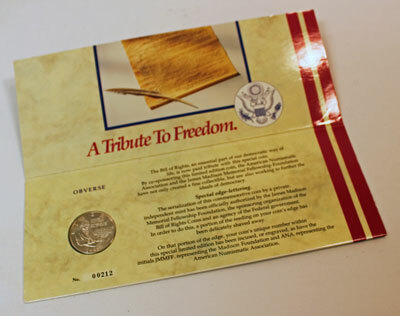 Inside, the message explains to collectors that the special edge lettering was performed by a private mint with official authorization. In order to apply the edge lettering, the independent mint had to shave away part of the reeded edge. 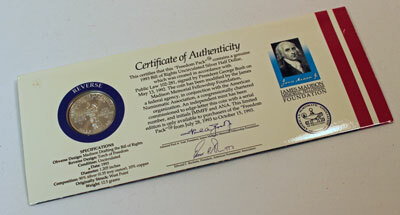 Leading representatives of the American Numismatic Association and the James Madison Memorial Fellowship Foundation signed the Certificate of Authenticity while an official US Mint signature was not included. The obverse of the uncirculated coin shows James Madison busy writing. At the bottom is this coin’s serial number, 00212. The reverse image includes the torch of freedom. 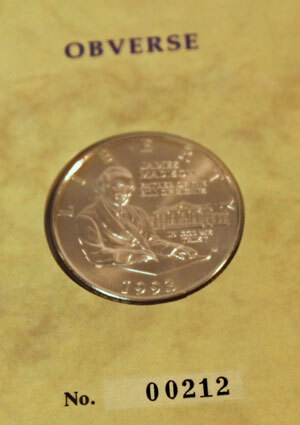 Below the coin, the specifications show the coin is 90% silver and contains 0.35 troy ounce of silver. So, is this special, limited-edition uncirculated Bill of Rights silver half dollar worth more than a regular uncirculated Bill of Rights silver half dollar? Some numismatic purists will claim that the coin was defaced after leaving the US Mint’s West Point facility. 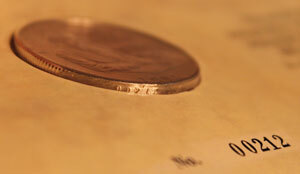 On the other side, some will claim the additional edge lettering give the coin more value. Finding someone who considers the edge lettering worth more could be a challenge and cost more than any increase in value.